Pulses, (beans especially) get a bad rap for producing gas and bloating. Did you know that this argument stemmed as a result of irregular pulse consumption? 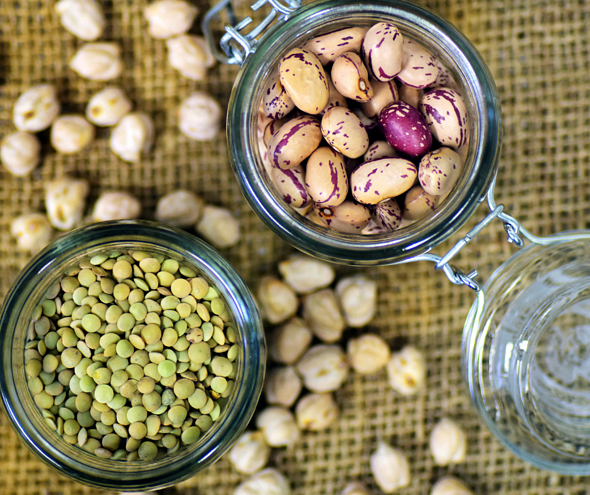 Tip: add baking soda to the soaking process of pulses before cooking to reduce flatulence and introduce pulses gradually into your diet with these super swaps. Pulses such as chickpeas and black beans make a great substitute for flour in baked goods. Using a 1:2 ratio of flour to beans try this healthy hack in your next batch of chocolate chip cookies or fudgy brownies. Powering up with plants doesn’t mean you have to forego meat. Try going half and half in your next pasta sauce or casserole. Stuck for ideas? Portobello mushrooms, leafy greens and fresh herbs, roasted peppers, shredded zucchini and lentils are all great choices to cut in with ground beef, pork, chicken or turkey. Mayonnaise adds calories quick with little nutritional punch. Spread sandwiches with plant based spreads such as pesto, chimichurri, bean dip or hummus. Oil in baked products such as muffins and desserts adds moisture, but so do beans! Puree chickpeas in place of some or all of the oil and add to your next muffin batch. Cheese provides a good source of calcium, while the fat helps keep us full over long periods, however the more variety in our diet the better! Swap half the cheese in lasagna or cream sauce with pureed white beans and you’ve got a dish with diversity, good nutrition – and a smaller carbon footprint!